The container in my car! If you’re a parent to young children you will hear the screams and the attitudes when you’re kids are hungry. And if you’re like me you’ve scheduled loads of playdates at parks, signed you’re kids up in numerous activities that are at least 30 minutes from home and run into construction at least once a day, probably at 4pm. So what’s in my basket/container at all times? Amazon and Costco carry the big bags, QFC carries the small ones. Chukar Cherry Medley If you buy them from Pikes Place Market you get a discount. I sometimes switch these out for dried blueberries. Peter Rabbit Organics I only provide the vegetable ones, since my girls eat an enormous amount of fruit without encouragement. My girls love the sweet potato, the spinach and the carrot flavors. Peanuts – plain (I buy the ones that you grind to make peanut butter from Whole Foods) Also the girls do love the peanuts from CB Nuts but that’s usually saved for road trips. Back to Nature Crispy Cheddar Crackers – I buy two varieties: cheddar and whole grain. Sesame Sticks – Whole Foods sells a few flavors, we enjoy the turmeric ones. Granola Bars – Clif Bar Energy Bar, Peanut Toffee Buzz is our favorite and Taste of Nature Snack Bars comes in close second. Raisins – small boxes or you’ll have them all over your car! Supplies: Spoons – plastic ones that can be recycled (washed and reused). By having spoons in the car I can grab some yoghurt in the morning and not worry about forgetting the spoons. Kleenex for tears and wipes for hands and face. You may wonder what is the state of my car. It’s not that bad. I do have a rule for myself that when I go to a gas station I must clean out the garbage while the tank is filling up. I do try, when I get home at the end of each day, to clean out the garbage and now I’ve started training/encouraging the girls to remove their trash. My supply chain- when I grab the last box of granola bars from my storage room, I reorder so I don’t run out of supplies in the car. I try to choose things that I can reach easily into the container and hand them to the kids. I also choose items that I like so when I get hungry I get something that can sustain me. 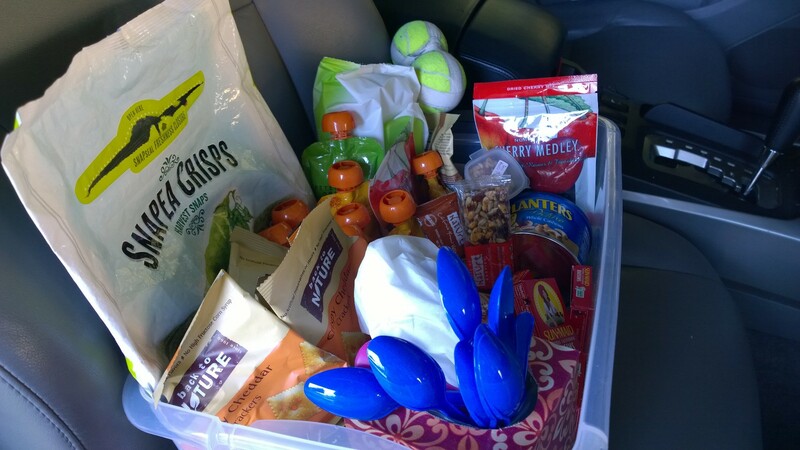 Having a snack supply that stays in my car has decreased the tantrums – both for my kids and myself. Think about yourself…have you found yourself heading into a meeting or an appointment and you are famished. You become a bit grumpy and rushed because you’re hungry. Having some nuts or something with protein in it keeps you going until you can get to a meal. What are some of the other items I always have in my car? Water – I have a large container of water for myself and refills for the girls water bottles. If we’re out at a park and they’ve used up all their water I don’t want to be caught without. Backpack – in this bag I have an extra set of clothes for the girls including underwear. Even though they are potty trained I always have an extra set in the car for emergencies. Kalencom 2-in-1 Potette Plus Red For the parks that have filthy toilets or for “I gotta go right now while driving” or at a park that has no facilities – it’s great to have this in your backpack. Tennis Balls taped together – for me. I have a bad back and when carrying children after scraped knees or falls, climbing on jungle gyms – my back sometimes needs a good roll. Old towel – in Seattle it rains. So when the sun comes out we head out to the parks. But the slides and swings can be wet so having an old towel to wipe it down makes the parks more fun. As summer approaches and the days are warmer – we all spend one more minute at the parks. But as soon as we get into the car the tantrums may start because we’ve past snack time, haven’t had enough food or water and we get stuck in traffic – I find having a container full of snacks at hand helps you get home with your sanity still in tack.Oh and if you’re meeting your husband/partner for an appointment and he hasn’t eaten all day – it’s also great for him! I’m always on the lookout for good snack foods that can stay in my car. Let me know yours.